Location: Saint Vidal, in the Haute-Loire departement of France (Aquitaine Region). Notes: The castle of Saint-Vidal is a fortress located in the commune of Saint Vidal in the Velay near Puy-en-Velay, in the department of Haute-Loire. The fortress besieged by the troops of Henry IV. Was never taken.The seigneury of Saint-Vidal existed as early as the 13th century, when it belonged to the family of Goudet. At the end of the thirteenth century the family of the Tower, lords of Barges (Haute-Loire), inherited the seigniory of Saint-Vidal, by the marriage of Hugues de la Tour, Lord of Barges with Adhémare Guigon de Goudet, lord of Saint-Vidal) The Tower's family then took the name of the Tour Saint-Vidal. In 1288, the Vicomte de Polignac left Hugues de La Tour the seigneurial justice of the place. The family of the Tower took the title of Baron de Saint-Vidal and kept the seigneury until the end of the sixteenth century. 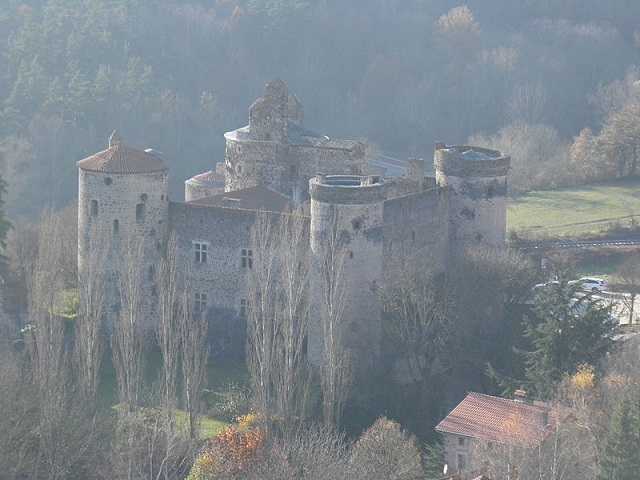 In the sixteenth century, Antoine I of the Tower of Saint-Vidal modernized the castle. It makes pierce berries in the house, builds an additional wing, connects the commons to the house by a gallery on two levels of which there remain some pillars and arches, makes pierce a monumental entrance portal in Roman fashion then put in vogue in France by the architect Sebastiano Serlio.